On Friday, February 22, Walpole Library's Community Room had some special visitors. In the room, there were three wooden crates, and one that resembled a cat carrier. But these were not felines. As children and their parents entered, they could hear the sounds of the birds ruffling their feathers. “What’s in that?” asked one kid, pointing to one of the crates, in which its resident could be heard hooting. As more children and their parents filled the room, the hooting seemed to get louder and louder. These birds were visiting the library from the Massachusetts Raptor Center as part of a Birds of Prey presentation. 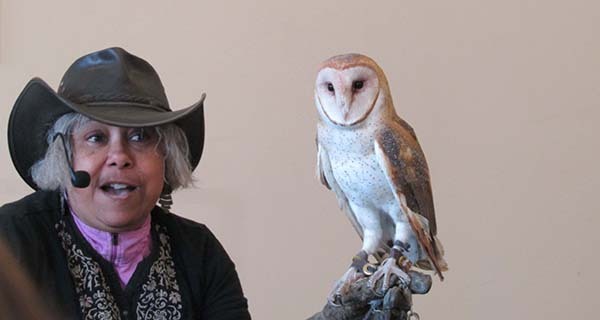 The goals of the Massachusetts Raptor Center are to educate people about birds of prey, as well as rehabilitate and release injured birds back into the wild. All of the birds Director Marla Isaac brought for the presentation were injured and unable to be released, or were raised in captivity for the purpose of education. Babe, the barred owl, began the show. Babe had made her presence known by hooting the moment her crate was placed in the Community Room. “She’s being fresh,” said Isaac, the program’s presenter and caretaker of the birds. Babe enjoyed looking out the windows of the room, moving her head as she followed her surroundings. "She likes to watch planes," explained Isaac. Isaac asked the curious children questions, and the answers left parents stunned. "How many vertebrae does a bird have?" she asked. "100!" said one child. Isaac chuckled. "They have 14," she revealed. Humans have 33 vertebrae. "How do they fly?" Isaac asked. "They have hollowed bones," said a child. Isaac nodded, "That's right." She showed the audience the wing of a deceased bird, explaining its anatomy. Isaac placed Babe back in her crate and took out the next bird: Rachel, a barn owl. "They have the best hearing of any owl," said Isaac. Rachel began bumping her head back and forth, as if she was trying to get a good look at everyone in the audience. "Does anyone know why her legs are so long?" Isaac asked. A few of the children took guesses. "It's so she reach through the tall grass to get her prey." As Isaac took walked around the room, Rachel began some owl antics. The owl flipped herself upside down, hanging off her handler's arm. "You're not a bat, Rachel," Isaac scolded. She went on to explain how these owls seem to live longer in captivity than they do in the wild. A barn owl's life expectancy in the wild is two years. In captivity, they can live up to 16 years. Barn owls do not tolerate New England's winter weather well, and tend to die during the colder month. Rachel is only two years old, and is expected to live many more years at the Massachusetts Raptor Center. Next, Isaac took out Moe, a red-tailed hawk. Moe has been with Isaac since 1996, when someone brought him, injured, to her. Isaac nursed him back to health, but knew that he would never be able to go back to the wild. Since he had grown up as a wild bird, Moe did not initially like Isaac. But the bird’s wild spirit eventually paid dividends. A little while after Isaac took in Moe, someone brought her a baby hawk that could not be returned to its nest because it had become a construction site. Desperate to find some way to return the baby to the wild someday, Isaac placed the baby bird with Moe. Moe adopted the baby and cared for it like it was his own. A while after, Isaac was able to successfully release the baby into the wild, since it had been raised by Moe. A final bird on display was a bald turkey vulture appropriately named Uncle Fester, after the popular Addams Family character. "Do you know what you call a group of vultures?" Isaac asked. No one in the audience knew. "A wake," said Isaac. She explained that turkey vultures are bald on their head so that they can reach into the carcasses of whatever they’re eating, without dirtying their feathers. "What sound do they make?" asked a child in the audience. 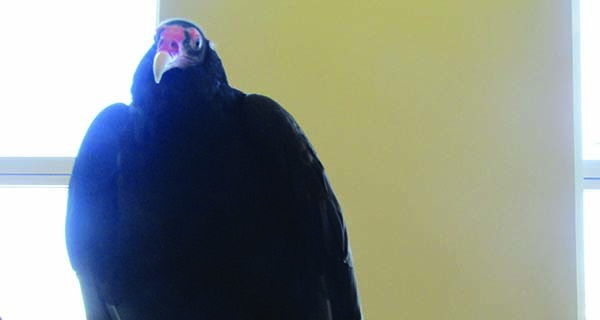 As it turns out, turkey vultures cannot make any vocal noises, since they do not have vocal cords. As Isaac walked around the room, Uncle Fester spread his wings wide. A vulture flies similarly to a kite, gliding about the sky so that they can smell the air and find food. After she finished showing Uncle Fester around the room, Isaac tried to place him back in his crate. He was not finished basking in the attention from the audience, however; every time Isaac tried to gently place him back in his crate, Fester would spread his wings just enough so he couldn't fit. For the kids and their parents, the presentation was a great opportunity to learn about our local birds of prey. Isaac ended the presentation by reminding the kids that they have the ability to do what she does and learn more about birds of prey.